Supporters and opponents of offshore drilling have one thing in common: neither believe Florida is off the table in the federal government’s proposed 5-year offshore leasing plan. 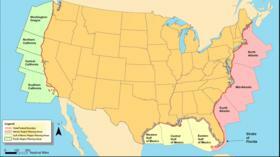 At issue is whether to open the Eastern Gulf of Mexico and Florida’s Atlantic coast to oil and gas drilling. Proponents say it’s needed to meet energy demands. But the shadow of the 2010 BP Oil Spill still looms and opponents fear the dangers of an oil spill outweigh any potential economic benefit. The federal government is gathering input now. “Then we’ll do further analysis… provide that feedback to the secretary, then maybe later this year he will provide more feedback and we’ll come out with a proposed program," said Mike Celata, regional director for the Bureau of Ocean Energy Management. The BOEM took written comments but not oral ones, which led environmentalists to hold their own hearing in a room next door. About three dozen people representing various organizations, university professors, environmental activists, city and county governments and excoriated a proposed five-year plan for offshore drilling rolled out by the Trump administration earlier this year. That proposal would allow up to 47 new oil leases off the U.S. coast, two in the eastern Gulf of Mexico. “As been said before, we’re in a tourism-based economy. It would crush us, and those of us who lived through the 2010 Deepwater Horizon [oil spill] saw what it did to our communities," said the Southern Alliance for Clean Energy's Susan Glickman. Shortly after the Trump administration announced its plan in January Florida Governor Rick Scott met with U.S. Interior Secretary Ryan Zinke, and the two men said Florida would be taken out of consideration. But a few days later, the BOEM appeared to contradict that—stating Zinke’s decision was not the final say on the matter. As proponents and opponents held warring press conferences across the hall, the federal government’s open house was a more low-key affair, with officials on hand to explain the process. The majority of Florida’s Congressional Delegation, Governor Rick Scott and the Florida Department of Environmental Protection are all opposed to the plan. But it wouldn’t be final until 2019, with any lease sales not expected until 2021.